The purpose of reading stock market charts and stock chart patterns is to determine the probable strength of demand versus pressure of supply at various price levels. The result of this is to predict the probable direction in which the stock will move and where it will probably stop. The clues are provided by the history of a stock’s price movements, as recorded on the stock market chart. In the stock market, history repeats itself often. On the stock charts, price fluctuations tend to fall into a number of patterns, each of which signifies a relationship between buying and selling pressure. Some stock patterns indicate that demand is greater than supply; others show the opposite and then some imply that they are likely to remain in balance for some time. Reading stock charts, or stock market graphs, and chart pattern analysis can be used to make short term or long term forecasts. Stock patterns can be as short as one hour or as long as many years. Chart patterns can be open to interpretation, and other aspects of technical analysis should be used to verify or refute the conclusions drawn. While many patterns may seem similar in nature, no two patterns are exactly alike. Careful and constant study are required for successful stock chart analysis. If you commit, learning how to read stock charts can be a fun and exciting adventure! For further in-depth information, the book Trading Classic Chart Patterns by Thomas Bulkowski, contains everything you need to know to help you learn to use and read stock chart patterns in a clear, simple and concise manner to improve your stock trading success. 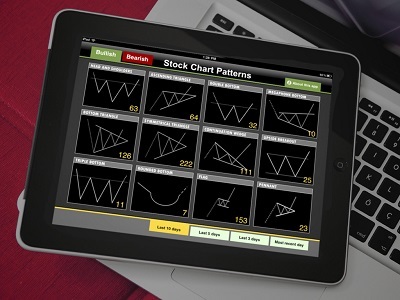 The "Trading Classic Chart Patterns" section will serve as a handy reference guide for your favorite chart patterns, including broadening tops, head-and-shoulders, rectangles, triangles, and triple tops and bottoms. You’ll quickly learn about the Adam-and-Eve combinations of double tops and bottoms, and how to select the best performers while avoiding the losers. Chart patterns fall into two main groups; reversal and continuation. Reversal patterns indicate a change of trend and can be broken down into top and bottom formations. Continuation patterns indicate a pause in trend and that the previous direction will resume after a period of time.